Significant Terms.. New players only, Max conversion £20, Only on Shamrock N Roll, Mayan Marvels & Candy Swap, 100x wagering, SMS validation req, No deposit required. Full T&C’s apply. Monster Casino lives up to its name, delivering big on games and service. The site puts its huge library of games at the forefront of the user experience, keeping any distracting navigation bars to the side. It is perfectly designed for any player, whether they are slot lovers or prefer the more traditional casino games. With a huge catalogue of varying types of online casino games, you’ll be certain to find a new favourite on Monster Casino. All of our SpinBonus reviews include a spin bonus star score to help give you a better idea of which online casino games are the very best. Discover which casinos have amazing customer service, the very best games and amazing payment systems. Our reviews focus on being thorough and fair, on allowing you to make the best decision for you and your playing style. 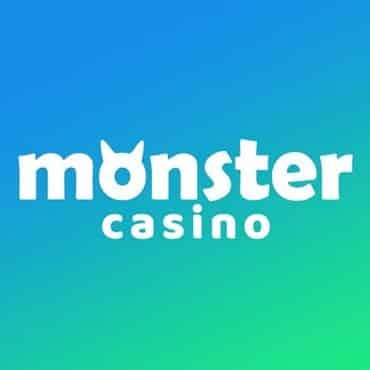 Read on to find out more about Monster Casino and how it holds up to other online casinos on the market. With such a huge variety of games as well as old favourites and new, upcoming online casino games, we couldn’t not award Monster Casino with five stars! From slots to live casino, instant win to mobile casino games, Monster Casino make sure it leaves no player behind. Combining this with amazing customer service and a huge range of payment options and you have one of the best online casinos around. Not only does Monster Casino have a large library of games, but the website is perfectly designed to make sure those games are easy to find and even easier to play. As soon as you land on the site you are greeted with more games than you could ever ask for. The slots catalogue is by far one of the most extensive and includes many of our favourites, including Gonzo’s Quest and Jungle Jackpots. It also includes many themed slot games for anyone looking to combine their favourite TV shows with their online slots, with games like Game of Thrones and Highlander. If slots aren’t your thing, then there is also many live casino and instant win games to choose from. Simply choose your favourite type of online casino game and we guarantee Monster Casino has a game that you will love. Information on the banking options for Monster Casino can be found in their lobby section of the site. All payment methods you can use to deposit into your account can be found at the bottom of the page. You can also find out any extra information by clicking the FAQ link in the footer of any webpage. The first bonus you will enjoy as a member of Monster Casino is a free £5 no deposit bonus. All you have to do is ensure that you have completely filled out your registration and you’re ready to start playing! After this sign-up bonus, there are plenty of other bonuses to take advantage of, including a 200% first deposit match on up to £50. The offers snowball from there and the more deposits you make the better the bonuses you will have access to. Many of these offers will be refreshed every month, keeping things fresh for new and old players alike. It’s worth checking back regularly to make sure you are getting all the very best offers available. Monster Casino has a great customer service set up, with live help, email and phone support all available. Email is available 24 hours a day, so no matter what time you find yourself playing, you’ll be able to message someone for help. The live chat and phone lines are not 24 hours. However they are open from 8am until 12am, so there is a large window for you to access these services if you need to. The user interface of Monster Casino is one of the best we have seen, with an easy to navigate menu and games categorised by type, you will be hard pressed to find an easier to use online casino. One of the features we love most is the simple layout of the home page. As soon as you arrive on Monster Casino you are greeted with brightly coloured games that you can instantly start scrolling through. When it comes to playing the games, you will be taken to the Monster Casino lobby, which is set out in a more traditional online casino layout, but equally as easy to use. Monster Casino is licensed by the government of Gibraltar and has strict fair play precautions in place, to make sure you are secure and all games are fair to play. Monster Casino also has RNG certificates from the UK, Malta and Gibraltar, which they display proudly on the website. New players only, Max conversion £20, Only on Shamrock N Roll, Mayan Marvels & Candy Swap, 100x wagering, SMS validation req, No deposit required. T&C's apply.